W2DU ferrite-bead choke balun (24 beads of no. 77 material from Amidon ($11 + S&H mid-2008 pricing) on 30 cm coax). For a version with 450 ohm feedline, make the antenna wire 2 x 13.75 m and the feedline 12.2 m.
For antenna wire I simply split 14.2 meters of #18 AWG multi-strand household zip-cord (1.02 mm Ø, 0.823 mm2). The choke balun is the one I use for all my antennas. I used the same construction techniques as for my ¼-size Cobra folded dipole. The antenna has been built (early February 2008), but is yet to be installed in the attic (the antenna is too long for my balcony; the attic covers my apartment and my neighbors') and put to the test. This type of antenna sells commercially for $50-$60 (ex S&H, ex coax, ex choke balun). Update 22 April '08: installed the antenna in the attic today , and hooked it up to my transceiver. First observations: the noise level is significantly higher than with my Cobra folded-dipole - about 4 S-points (on the non-calibrated S-meter of my transceiver). Have not (yet) been able to determine relative signal-to-noise ratio. 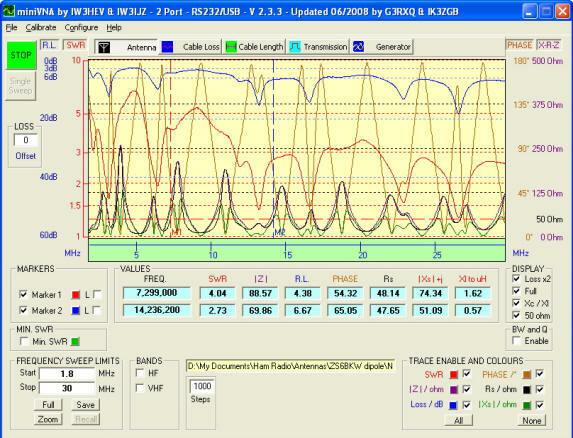 Update 28 April '08: have tuned the antenna on all bands 6-80 meters (SWR 1.1 - 1.9). 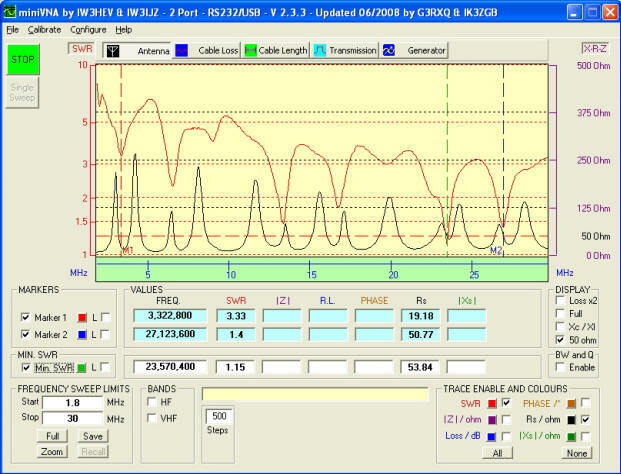 Have also hooked up my miniVNA antenna analyzer. See plots further below. So far I'm not impressed, esp. compared to my Cobra antenna - maybe I'm doing something wrong, hi! Further tests will have to tell. Update 14 March 2009: tried the antenna once again. In the waterfall display of my digi-mode software, I noticed strong noise/interference throughout the audio band: 50 Hz and all its even & odd harmonics. I went up in the attic and used a small portable AM transistor radio to identify the source of the noise that is picked up by the antenna: it is the switched/pulsed power supply of the very large (1.5 mtrs, 5 ft diameter) ventilation fan of the apartment building. 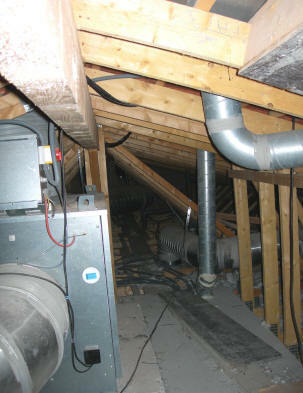 The fans are also located in the attic, as is the associated large-diameter aluminium ducting. So the noise is the switching frequency of the power supply (10s or 100s of kHz) and harmonics thereof, modulated with the 50 Hz of the line voltage. 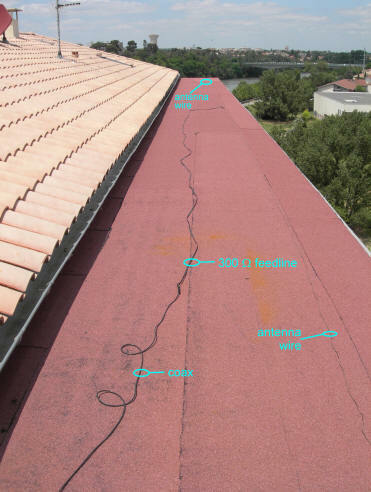 The antenna runs by the fan at about 1 m (3 ft), and one leg parallels the ducts at about the same distance. At this location, the antenna is not usable! Update 19 June 2009: Don't have the required 28½ mtrs (93 ft) room on my terrace. Decided to give it a final try on the flat concrete roof that covers the wrap-around part of the terrace (see diagram below). It is about 2m5 wide (8 ft) and runs along the entire building (≈30 mtrs), just below the rain gutters. Will not be able to run the 300 ohm feedline perpendicular to the antenna; not sure how that impacts the antenna characteristics... Hooked it up to my transceiver and now it is quiet; both the noise and the signal level appear to be lower than that of my Cobra antenna. Update 9 November 2009: rather than just have the antenna be piled on my antenna bone yard, I decided to try the antenna in an "L" configuration, with one leg vertical - in this case: straight down the outside wall of the 7-storey building (8, if you count the US-way). The resulting plot of the antenna analyzer is closer to that of the attic installation - but with a clean signal! Update 11 November 2009: tried the above L-configuration last night, and for some reason, it picked up lots of QRN across all the HF bands. The waterfall display of my digi-mode software showed the same multiples of 50 Hz that I had with the installation in the attic. So I have tried yet another installation configuration. Not a pure "L", but close. The horizontal leg now goes across the main part of my terrace, about 1.5 mtrs (5 ft) off the ground. The far end of this leg is tied off at about 2 mtr off the ground, at a PVC tube that is stuck into an umbrella stand. The wire is a tad too long for my terrace, so the last 75 cm hang down along the PVC tube. The opposite leg of the dipole again goes straight down along the wall of the building. Update 13 December 2009: as the frequencies of the resonance dips are too low, I have folded the last 75 cm of both antenna legs back onto themselves. This helps! I tried and folded back more, but that did not result in further increase of the resonance dips. 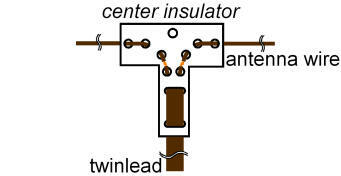 Based on a suggestion that I found on the antenna pages on the website of Frits, PAØFRI, I have rolled up the twin-lead feedline. 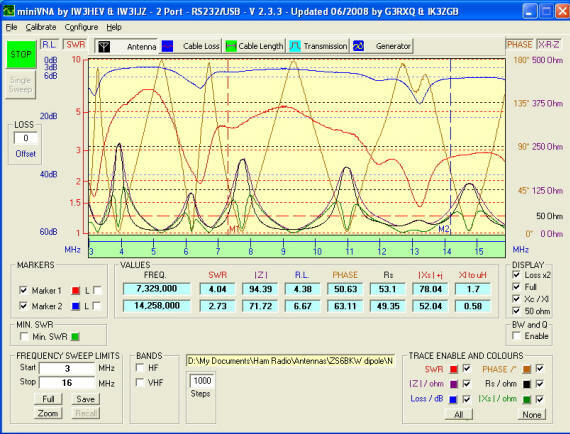 No change in antenna tuning characteristics. 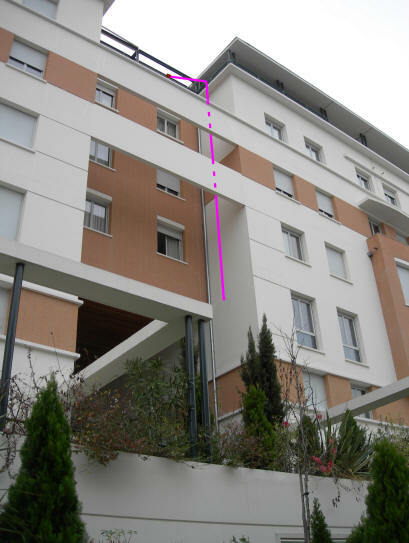 The photo below shows how the antenna hangs down from my terrace, about 30 cm away from the outside wall of the building. I do reel it back in when I'm not QRV. 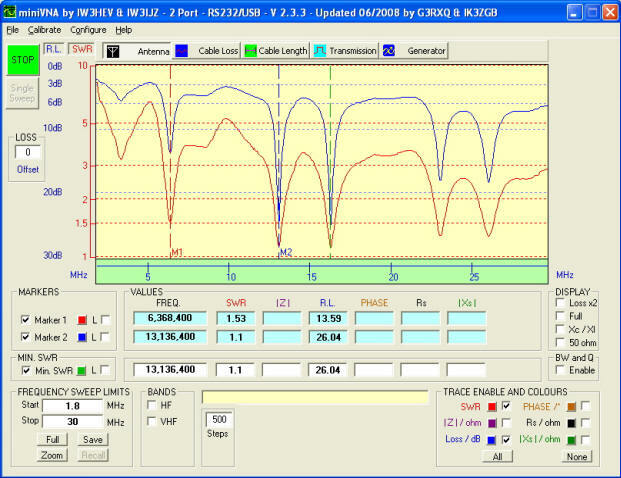 With the antenna in the attic, I hooked my miniVNA antenna analyzer up and obtained the plots below. Still trying to interpret, and figure out how to improve things (or: get the darn thing to work). The SWR plot immediately below shows that all frequencies with low SWR (where I should be able to use the antenna without a tuner) are lower than the where they are supposed to be. 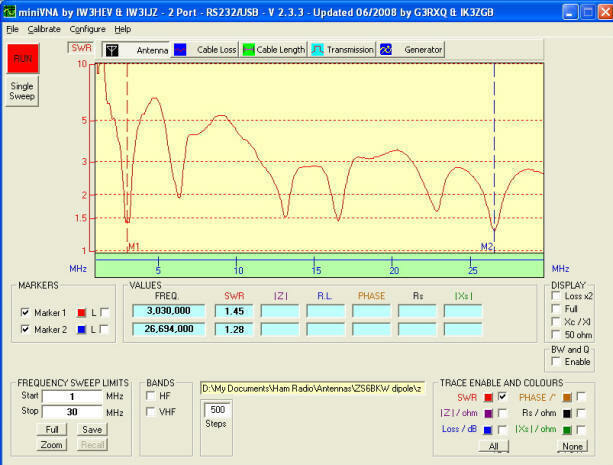 This shift is about 0.5 MHz at 3.6 MHz and appears to increase fairly linearly to 2 MHz at 24.9 MHz. The following plot is for the "L" configuration with one vertical leg. 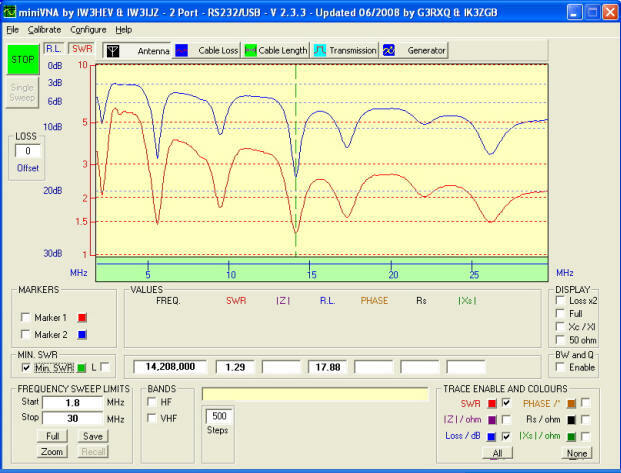 SWR dips are located at 3322, 6594, 13418, 16858, 23627, and 27124 kHz. Again, all too low! The following plot is for the second "L" configuration with one vertical leg. SWR dips are now located at 3322 (not changed), 6368 (lower), 13136 (lower), 16136 (lower), 23175 (lower), and 26231 kHz (almost 900 kHz lower!). However, the SWR dips now go down much lower: Some down to 1.1.